Measure temperature using a resistor! These thermistors are pretty hardy, you can strip the PVC insulation and stick the wires into a breadboard or solder to them directly. Of course you can cut or extend the wires. 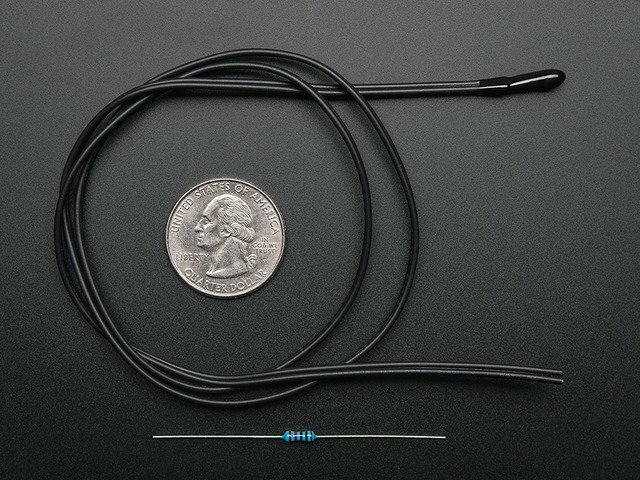 Since the resistance is pretty high (10Kohm) the wire resistance won't make a huge difference. Now we want to connect it up to a microcontroller. Remember that when you measure a voltage (Vi) into an Arduino ADC, you'll get a number. What is nice is that if you notice, if Vcc (logic voltage) is the same as the ARef, analog reference voltage, the values cancel out! It doesn't matter what voltage you're running under. Handy! Connect one end of the 10K resistor to 5V, connect the other end of the 10K 1% resistor to one pin of the thermistor and the other pin of the thermistor to ground. Then connect Analog 0 pin to the 'center' of the two. If you are not getting correct readings, check that the 10K resistor is placed between VCC and A0, and the thermistor is between A0 and ground. Check you have a 10K Thermistor and that you are using a 'standard' NTC thermistor. On a "5V" microcontroller like classic Arduino or Metro 328, use 5V for the VCC pin. On 3.3V microcontrollers like Feather or Arduino Zero, use 3.3V for the VCC pin. If, when you heat up the thermistor, the temperature reading goes down, check that you don't have the two resistors swapped and check that you are using an NTC not PTC thermistor. When doing analog readings, especially with a 'noisy' board like the arduino, we suggest two tricks to improve results. One is to use the 3.3V voltage pin as an analog reference and the other is to take a bunch of readings in a row and average them. Taking multiple readings to average out the result helps get slightly better results as well, since you may have noise or fluctuations, we suggest about 5 samples. This sketch takes those two improvements and integrates them into the demo, you will have better, more precise readings. Note that this code specifies an EXTERNAL voltage reference. To work properly, you must make the additional connection to the AREF pin as shown in the diagram above. // connect AREF to 3.3V and use that as VCC, less noisy! Finally, of course, we want to have the temperature reading, not just a resistance! If you just need to do a quick comparison circuit (if temperature is below X do this, if its above Y do that), you can simply use the temperature/resistance table which correlates the resistance of the thermistor to the temperature. However, you probably want actual temperature values. To do that we'll use the Steinhart-Hart equation , which lets us do a good approximation of converting values. Its not as exact as the thermistor table (it is an approximation) but its pretty good around the temperatures that this thermistor is used. However, this equation is fairly complex, and requires knowing a lot of variables that we don't have for this thermistor. Instead we will use the simplified B parameter equation. For better precision, we suggest reading the exact value of the 'series 10K' it should be nearly exactly 10K but if you can get a better reading that will reduce your error. You may notice that above, the temperature reading is 28.16°C - does that mean we have 0.01°C accuracy? Unfortunately no! The thermistor has error and the analog reading circuitry has error. In general, we think thermistors are higher precision than thermocouples, or most low cost digital sensors, but you will not get better than +-0.1°C accuracy on an Arduino with a 1% thermistor and we would suggest assuming no better than +-0.5°C. If you have a 10K thermistor + 10K resistor connected between 5V and ground, you'll get about 5V / (10K + 10K) = 0.25mA flowing at all times. While this isn't a lot of current, it will heat up your thermistor as the 10K thermistor will be dissipating about 0.25mA * 2.5V = 0.625 mW. This guide was first published on Jul 29, 2012. It was last updated on Jul 29, 2012. This page (Using a Thermistor) was last updated on Apr 21, 2019. Light up your mailbox and get notified when your products arrive!